I’ve been having lots of fun on Google Plus these last couple months. Ever since I got my invite I’ve been playing around with it to see what the value of the social network is for concert fans. And I have to say that I’m really excited about the possibilities. What I love the most about the experience is that there’s a lot of functions that are improvements on Twitter and Facebook, and this is the first post, of many I’m sure, where I’ll be sharing with you what I think are some of the best ways for you to get in on the fun as other concert fans are having with the new social network as it evolves. What Happened During The Metallica Live Stream On YouTube? 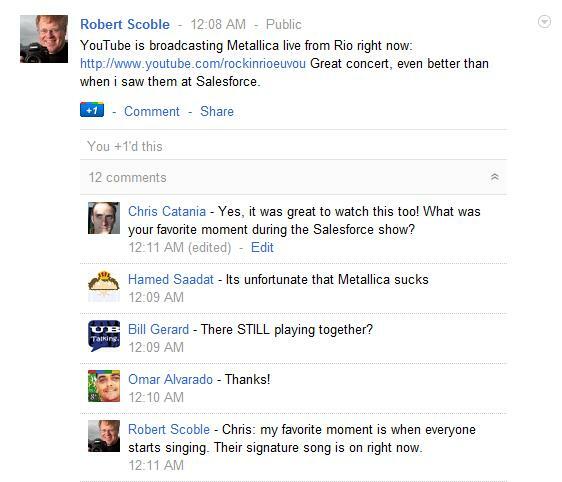 For starters last night I had one of my favorite virtual concert moments when I was a part of a thread started by Robert Scoble who posted about Metallica being streamed live from Rio on YouTube. The reason I loved this moment was because it was so fluid and spontaneous and the nature of the thread was filled the buzz of discovery and thrill of real-time storytelling and memory sharing about everyone’s feelings about Metallica at that exact moment and thoughts about Metallica in general. I was working on another project and I had my Google Plus stream open and the second I saw Scoble post about the Metallica concert which I was also watching at the same time, I posted a comment and asked him a question about his Metallica concert experience. A few minutes later, Scoble responded with the post noted above in the screen shot. And it was fantastic to get insight into how the show was moving him at that moment mainly because that’s what I love to do. I love to know what it is about a specific live music moment that gets us so excited and I think Google plus has the greatest possibilities to do just that. And from there the others joined in and the thread on the Metallica YouTube live steam really took off! It was quite the rush to see everyone chime in from all around the world. Some fans where in Rio, some had friends who were at the show and others were just adding context to their real-time experience by posting comments about what they were loving about the show. Here are some of my highlights of the thread, especially Nick Wood post about mixing in Google Plus Hangouts. I’m calling out Nick’s comment because I believe Hangouts possess the greatest possibility for concert fans to experience live music and share our concert story in a whole new way. I’m not going to get into all the details right now but I will tell you that some bands are already taking advantage of the Hangouts such as Joe Satriani and other artists who’ve been using the live video chat feature to take fans into the studio and share live show stories. Why Should Bands Start Using Google Plus as Fans? And when you think about, the benefits for bands to start using Google Plus now it that it’s a fantastic way to connect with core fans on a very grass roots and personal level. And those bands that do jump in on threads like this Metallica one, or other live music threads, and interact with fans will certainly stand out. How cool would it be as a fan to find yourself randomly interacting with James Hetfield or the member of your favorite band in a thread on Google Plus. If this were to happen, it would be a great way for band buzz to build virally on a social network during a tour or before a tour kicked off. As you can tell, I’m pretty jazzed about this sort of thing and I’ll be posting more examples and info to this post and future posts as I discover other artists who are using Hangouts and other Google Plus features in creative ways. But right now, the band’s taking advantage of these great opportunities are few and far between because there’s not a whole lot of bands on the network yet as Mashable points out. What Else is Getting Me Jazzed About Google Plus (So Far)? That said, the most buzz and excitement I’ve experienced so far is when I interacted with other fans and Google Plus staff who’ve also been demonstrating how to best use the network for sharing virtual concerts experiences and live music memory storytelling. And it those those types of experiences where I’ve gotten most of the value out of Google Plus, which is why I’ll be pointing you in the direction of insightful folks and fellow concert fans like Natalie Villalobos, a Google Plus Community Manager. Natalie’s shared her backstage and front row experience with the Black Eyed Peas front man Will.i.am and her favorite ACL moments. She’s also posted helpful info like this one that I shared about how you can use Google Hangouts and other new features to enhance your concert experiences and connect with other fans. On Live Fix, we’ll also be doing some Hangouts just for concert fans, and if you want to be invited go ahead and connect with us on the Live Fix Google Plus page and we’ll let you know when it’s happening. Until then, I’d love to hear what you’ve been experiencing on Google Plus so let me know what you think in the comments below and we’ll share your story on future episode of Live Fix Radio. How Would Lady Gaga, Katy Perry, Beyonce, Rihanna… Handle The Chaos of Altamont?